POWERFUL APHRODISIAC: Our thoroughly concentrated and blended formula include potent extracts from: Maca, L'Arginine, Tongkat Ali, Sarsaparilla, Pumkin, Muira Puama, Tribulus Terrestris, Cayenne pepper, Astragalus, Catauba Bark, Orchic Oyster, Nettle, Oat Straw, Zinc. TESTOSTERONE BOOSTER: Male characteristics including strength and muscle mass are reflected due to the presence of the testosterone. Science has it that high testosterone levels cause increase in lean mass and strength, and fat reduction. 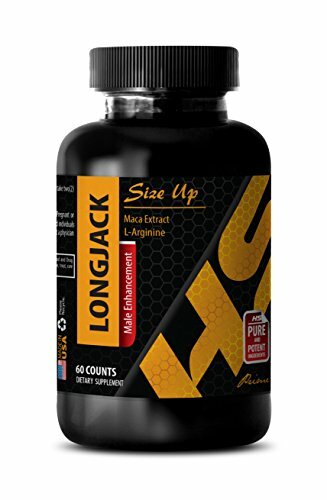 Long Jack has been identified as an effective natural supplement for increasing testosterone without any side effects. LIBIDO BOOSTER: No matter your gender, a testosterone boost can be a helpful way for increasing sexual flame and desire. Folklore says that Tongkat ali is helpful for increasing the sensitivity of a woman's erogenous zones, further increasing its libido-boosting qualities. While research has shown that the herb boosts libido in men's. MUSCLE GROWTH: Tongkat ali is a popular natural supplement among weightlifters and body builders who are looking to change their muscle to fat ratio. However, you don't need to be a serious athlete to benefit from the potential improvements in body composition that Tongkat Ali can provide. LONGJACK SIZE UP: Longjack (Eurycoma Longifolia Jack / Tongkat Ali / Malaysian Ginseng / Pasak Bumi) is a bitter tasting herb extracted from the Eurycoma shrub grown in Malaysia and Asia. The Eurycoma Longifolia Jack extract is taken from the roots of the plant. WEIGHT LOSS: The all-natural ingredients in this amazing product have strong aphrodisiac properties and have been proven to be beneficial for enhancing libido, improving sports performance and weight loss, providing natural anti-ageing support, improving a person's overall well-being, and reducing fatigue. BONE SUPPORT: Low levels of testosterone can increase the chances of developing weak and brittle bones. Tongkat ali's ability to increase testosterone levels means that it could be an important weapon to help maintain bone strength and health. MOOD SUPPORT: Tongkat Ali can be beneficial for reducing tension, anger, and confusion. The herb may also be helpful for reducing the effects of everyday stress associated with diet, sleep loss, and even exercise. Improved memory is also associated with Tongkat Ali supplementation.